Yandex, Russia’s leading search engine has launched its very own browser called the … you guessed it … Yandex Browser. The browser has been developed based on Chromium open source code and is very simple one with minimalistic looks. Cloud-based browsing is a next-generation answer to the challenges of the modern internet, said Arkady Volozh, CEO of Yandex. To make the internet experience faster, easier and safer for everyone, we have built a cloud-based browser that integrates the best of our products and services and is open to other web developers. The Yandex browser uses the WebKit engine. The browser’s user interface is based on the open-source Chromium code. 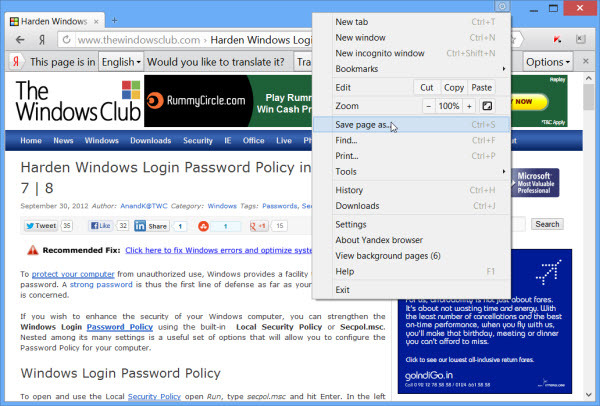 The Yandex browser platform has been expanded to incorporate Opera Software’s Turbo technology. The browser has also been augmented with out-of-the-box plug-ins, including the latest versions of Adobe FlashTM and a PDF reader. The browsers appears to have been primarily made for the Russian speaking users, because when you open any English web page you see a bar stating that this page is in English – Would you like to translate it? The bar, of course does not appear when you open a page in the Russian language. This browser can however translate foreign webpages with ease. It is fluent in 9 languages including English, German, French and Ukrainian. The browser loads pages quickly. Bookmarked or favorite sites are only a click away and colorful widgets will show you up-to-date information about the weather and traffic, as well as social network notifications. The default search is of course Yandex, but you can change it to another one of your choice, should you so desire. The unified Smartbox lets you type the URL as well as search queries. All webpages, before they are loaded, are checked by the Yandex security system while all downloaded files are scanned by the Kaspersky anti-virus. On first run, the browser will offer to automatically import your bookmarks, browsing history and settings from your default browser. Very recently, Yandex was dropped as the default search engine on Firefox and replaced with Google search in Russia. Google Chrome uses Google Search. This move therefore, is considered by many as one, to contain the increasing presence of Google search in Russia. With the launch of the Yandex Browser with the Yandex Search as default, the company hopes to stem the loss in its market share. Visit browser.yandex.com to download the English version and browser.yandex.ru to download the Russian version.